and get the latest food news, events info & seasonal recipes. Food. We all eat it, we all depend on it. It has a huge impact on all our lives and on our health whether we realize it or not. Food is often what binds and brings both family and friends together. But what sits on the plate is as much a slave to fashion as what hangs in our wardrobe. Not a day passes without our being told to buy organic, buy local, buy Slow, eat fast or eliminate something. It can be confusing and overwhelming. 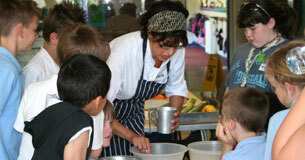 All About Food is a food consultancy specialising in food education. 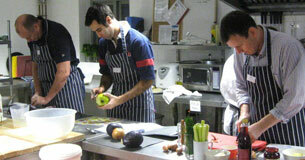 It teaches food knowledge and builds confidence and skills in a fun and welcoming environment. We provide information that can easily be applied to daily lives, inspires people to get cooking and encourages healthy eating habits. Our courses and cookery demonstrations within the Public, Private and Voluntary sectors cover a range of topics including: healthier cooking practice, skills-building, training for trainers, corporate team building, cooking on a budget, nutrition for health and cooking from scratch. We believe that everyone can cook if the desire is there. It is so creative and immediate. Starting with raw ingredients, some hands-on guidance and a positive attitude, in no time at all you have several dishes to try. Cooking and eating is so much more than sustenance, and that's what you will experience and enjoy learning about when working with us. We offer you the ingredients for change. An engaging and practical session to encourage staff to think about how they take care of themselves, with practical tips covering nutrition, building resilience, and an introduction to mindfulness with lots of takeaways for the staff to try. We offer one-off sessions, a series, as part of an away-day or workplace wellbeing initiative. Book now!